On November 13 Calgary's residents will vote on whether they want to host the Games in eight years' time, but Naheed Nenshi said that a yes vote "does not necessarily mean yes at all costs". "It allows the work to continue but Council still reserves the right, if there's not a good deal there or it doesn't work for the City of Calgary, to pull out of the process," he has been quoted as saying. Fifty-one per cent in favour of hosting would be enough for the yes vote to win the plebiscite, but Nenshi added that he would like to see a greater majority either way. While the plebiscite is not officially until November 13, advanced voting has already started with long lines reported at polling stations. According to the City Council, 28,923 Calgarians have already cast a ballot in person and 7,738 have voted through the post. It comes after officials in Canmore, a town just outside of Calgary which would host events, voted to support the bid. The Town Council voted by six to one in favour of Calgary hosting in 2026, with their Mayor John Borrowman saying he is confident this is the right decision. Just a week ago it looked as if the bid might collapse due to a lack of a funding agreement between Calgary City Council and the Federal and Provincial Governments. 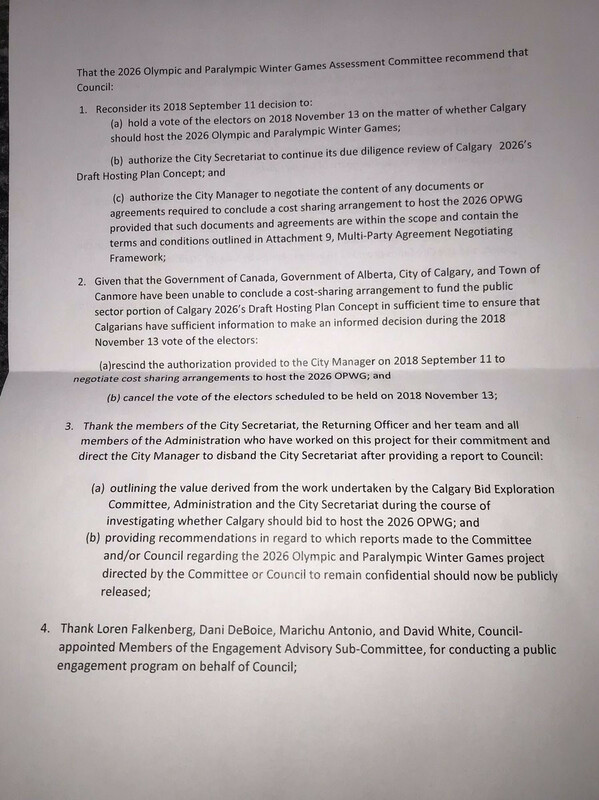 Calgary Councillors voted 8-7 in favour of approving a recommendation to terminate the bid, but this fell short of the 10 votes required for the motion to pass. This came after it was announced that a last-minute funding deal had been struck by the three parties. The announcement included a letter saying the required total of CAD$2.875 billion (£1.721 billion/$2.190 billion/€1.929 billion) of public funds would be met. It was signed by Alberta Premier Rachel Notley and Federal Minister of Sport Kirsty Duncan, and also included a space for Nenshi's signature. The deal is said to mean CAD$4.4 billion (£2.6 billion/$3.4 billion/€3 billion) for the local economy, creating jobs, prosperity and growth. It is also claimed it will lead to CAD$1 billion (£599 million/$762 million/€672 million) in wages for Calgarians and 15,400 jobs. The City of Calgary would need to invest CAD$390 million (£234 million/$297 million/€262 million) and would get CAD$10 (£6/$8/€7) in return for every dollar it invests. The news came as a big boost for the International Olympic Committee, with the 2026 race in danger of complete collapse. Swedish capital Stockholm and a joint Italian bid from Milan and Cortina D'Ampezzo are the other contenders but neither have secured Government support. Calgary also hosted the 1988 Games.